Ok, I have made no secret about the fact that I am a stat monger. When it comes to running, I keep myself motivated by setting goals and tracking my stats to chart my progress. From the First Mile I ran on my Casual Running journey, knowing how many miles I ran and the improvement in my performance has been both a key motivating factor and a source of pride for me. It has also kept me honest (no cutting corners, er, miles!). 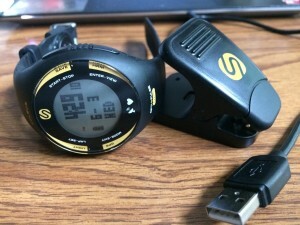 The Soleus GPS Pulse with its charging & data cable (included). Since that First Mile, however, I have always relied on apps on my various IPhone devices to track these miles for me. Even though Nick has been singing the virtues of GPS watches, and even included a Soleus on his Casual Runner Christmas-wish list last year, I had never tried running with a GPS watch, so I had no idea if I would like it or if I would even care about it. Then…I tried my hand (or wrist?) at the Soleus GPS Pulse, and I liked the freedom that wearing a watch afforded me. Check that, I LOVED the freedom that wearing a watch afforded me over using my app. 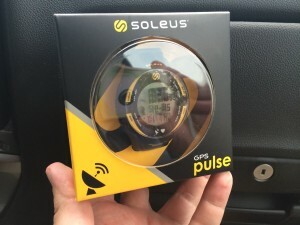 The Soleus GPS Pulse. That is self-explanatory, right? It is a watch, it tracks your workouts using GPS technology. It also checks your pulse. So, it is not just a clever brand name. I chose this model to test out over other products for several reasons. First, it has a built-in heart rate monitor. At the urging of a friend I downloaded a heart rate monitor app for my IPhone a few years ago and…yeah…I never use it. It is not that I did not want to, it is just that I never think about pulling up the app. I also have never used a chest strap, and really never had a desire to, but I still wanted to be able to track my heartrate. Thus, the built-in feature makes tracking your heart rate oh so easy. Second, this model advertised itself as having a night mode built in. As you know, I believe that you can never make yourself visible enough while running at night, so the fact that this watch adds extra visibility is a plus that I wanted to see (spoiler alert: I really like this feature, and will like it more so when – unfortunately – the early sunsets of winter return). First off, do not expect to buy this product, pull it out of the packaging, and just head out for a run (I may have made that mistake! Don’t judge me, I admit to being impatient, especially when it comes to new toys). While the watch does come partially charged, the directions do urge you to give it a full charge. The charger comes with it and is easy to use, however it does not charge as fast as impatient Casual Runners may like, so I find it best to get in the habit of keeping it charged so that it is ready to go when you are. Full disclosure, I did not find the written directions to be all that helpful. I am sure there are people who could have used the directions to get their watch set up in no time, but my brain just does not work that way. So I struggled a bit trying to follow the directions. However, I went to the Soleus website and found their YouTube demonstration videos, which I followed and set my watch up with no problem. Why didn’t I just do that to start? Well, this is a product review and I owe our readers a review of my experiences. So, pick your preference for setting up your watch, but I would urge you to follow the videos if you are anything like me. 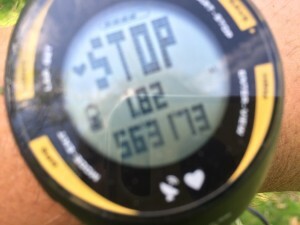 The easy-to-read display makes the data easily accessible mid-run, or mid-bike ride, or, in this case, mid-lawn mowing (no, that is not my running pace, give me some credit!). Once you head out for a run, you need to make sure you connect it to the satellite signal. This is easily accomplished by exiting the building you are in, turning the watch on, and waiting until it tells you that it acquired signal. Sometimes this happens within a few seconds, but I have experienced it taking up to 2-3 minutes, which can seem like an eternity when you are waiting to get out for your run, but its ok, you can take the opportunity to adjust your shoelaces, hydration belt, or whatever, just don’t forget to wait for it to acquire satellite before you start running (yeah, I may have made that mistake as well). Once you are ready, you just hit start. Wait, that’s it? Yup. That’s it. The watch automatically tracks your distance, speed/pace, total time elapsed, intervals (which you can set), heart rate, course, and I am sure a bunch of other things that I have not yet figured out. When you are done, you hit stop, and then hold the button to save the workout when prompted. In this regard, these functions of the watch could not be any simpler to use. Additionally, playing around with the watch is fun. In addition to running, I may or may not have used it on a few bike rides and while mowing my lawn (come on, admit it, who among us never thinks about how far they walk while pushing their lawn mower?). This watch does what it promises: it tracks the pertinent data for your workout. But to be honest, I expected it to do that. What impressed me was what I did not necessarily expect. When you use a phone app, you have to pull it out of your pocket to check your progress, or set audible alerts/reminders which are hard to change mid-run. The display of the Soleus watch is so large and easy to read that I could easily reference it at any time during my run…including when it rained (it is water resistant), which I would definitely not do with my phone. Additionally, I can honestly say that this is the most comfortable watch that I have ever worn. The soft rubber of the band is super comfortable even on long runs when I am sweating…a lot. I was worried that it would annoy me, but it did not. I even wore it with sweatbands on a few runs and did not have any discomfort. So yes, it does take a while to charge the battery, but the battery life is quite robust. During the Marine Corps Marathon, I had to turn off my tracking app because it was killing the battery on my IPhone. This means that the app was completely useless to me as I finished that race and on all of my other long races since. This battery will certainly last for several long runs without a problem, but I cannot tell you how many yet as I have yet to exhaust the battery below 40%, and that was after 4 or 5 consecutive days of training runs all in excess of 1 hour. (I know that rest days are important, but the weather here has been amazing lately). This watch does not automatically sync to your tracking software. You need to physically connect it to your computer using the charging cable attached. This is where I still need to play with the watch and its software some more, as I am certain that I have only begun to scratch the surface of what I can do with the recorded data. I also find it easiest to delete old runs from the watch when I am connected through the computer software once I know that the data is uploaded. In relatively short order this watch convinced me that I definitely prefer wearing a GPS watch to using a smartphone app to track my runs. This is not to say that I am liberating myself from my IPhone, far from it. I am still so addicted to and dependent on running with music that I will never head out the door without my IPhone, the watch just allows me to leave it in my pocket once I get underway, which is a nice feeling. Also, smartphone touchscreens can be difficult to use with sweaty post-run fingers, the Soleus does not have any such problems. Oh, and the watch came with a motivational inscription. Mine reminds me that “There is no finish line.” Yup, that sounds about right, as I do not plan on my Casual Running journey ending any time soon! Neither Mike nor Casual Runner received any compensation for this review. The product reviewed herein was provided by the manufacturer for purposes of this review and the opinions are solely those of the author.